Water is a precious finite (not infinite) resource. Organic growers are perhaps the best on earth at using water efficiently and effectively. Here are some ideas which will help you not only make your growing area drought proof, but water mindful. • Whether you grow in pots, back garden or an allotment, you can make your soil hold water effectively by adding homemade compost or leafmould. This bulky material, full of nutrients, will help the soil structure – sandy soils will retain water better, and clay soils will become less dense. Add compost in the spring, about a barrowload every 5m2. • To prevent water evaporating from the soil, mulch it. A covering of grass cuttings, leafmould, straw - even cardboard - after you have watered will keep the moisture contained. If you grow in pots, use gravel on top to stop the soil transpiration. • Protect your plants. Direct sun, or wind, will dry out the soil. Any windbreak will give shelter over a distance of six times its height, and should filter rather than block the wind. Hedges and trellis for climbing plants is perfect, providing shelter for birds and insects as well as the ground beyond. • Water the soil, not the plant. And make sure the water goes deep. It is better to give the soil a good soaking every few days rather than just wetting the surface regularly. This will encourage the plant from a young age to put down deep roots away from the surface of the soil, which dries out more quickly. • Water in the evening, after the sun has gone. Or in the early morning when the soil is cool. • Most mature plants benefit from intermittent deep watering, using a watering can. (Don’t forget to mulch afterwards.) Seedlings, plants in pots, and other greenhouse plants can be watered using a drip irrigation method – which provides a minimal constant water supply. • ‘Sumps’ can be easily constructed and used to get young trees established. Use a 40 cm length of piping, with a few holes punched near the bottom. Insert it about 25 – 30 in the ground near the tree, ideally when planting. Pour water in it, to ensure constant moisture round the roots. You can fill the tube with gravel to prevent the water rushing down. • Clay pot watering. This is particularly useful in very dry conditions, and allows you to go away for a week or more without worry. Take an unglazed clay pot and seal the hole in the bottom so water can’t escape. You also need a lid to the pot – make your own from wood or sturdy plastic recycled from a container. Sink the pot in the ground, fill with water and cover. Plant seedlings around the pot. The gradual escape of moisture should last for 10 days before needing a top up. • What NOT to do! Don’t water lawns, they always recover. Don’t use a sprinkler – too much water is lost in the air and doesn’t penetrate straight to the roots. 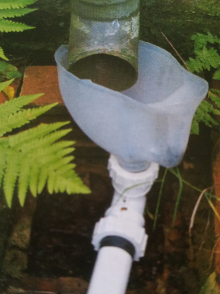 • Make sure all your down pipes have water butts connected. Even the greenhouse and garden shed. If you have room, install two butts, linked together. • Can you improvise and recycle containers? Old central heating tanks and any other rigid plastic containers (well rinsed and washed out before use). • Keep water containers covered to prevent algae and insects colonising the water. • Keep all rinsing water – washing vegetables, salads, even your hands, will collect a surprising amount by the end of the day. • Collect and use ‘grey’ water, from baths and washing up. Hand pumps for baths are available. Some down pipes are open at the drain end, so you can fix a diverter into a water hose, using a combination of a cut-off large plastic milk container and plastic pipe connections. • Make sure you don’t use too much soap/shampoo (the residues can build up in the soil) and use the water straight away. Stored grey water can harbour legionnaires disease. Water that has washing powder or washing up liquid in it can be used, but infrequently – this is because the modern detergents have enzymes and phosphates in them which, if used in concentration, an actually harm the plants. The water is also often surprisingly greasy by the end of a washing up session – this grease may affect soil life and particles. • Use ecologically friendly detergents, and avoid using grey water continually on the same patch of ground or pot. • Don’t use grey water on seeds. They are prone to ‘damping off’, a technical term which covers a variety of fungal infections. Use fresh tap water instead.